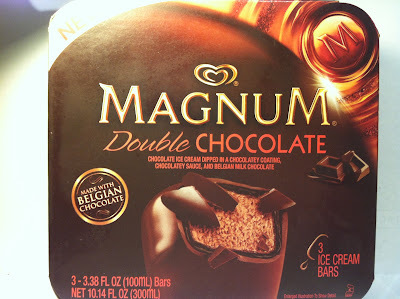 I've done several reviews of Magnum bars here on the blog and after each review, I get some sort of message from someone telling me that since I liked the bar that I just reviewed, I should try the Double Chocolate bar because I'll like it even more. After finally getting enough of these messages, I put it on my to-do list to try as soon as it went on sale at my local store and when it I finally did go on sale (I am a bargain shopper after all! ), I snatched up a three pack of these to try. The sale price at my local Meijer was $3.00 and each bar is a decent sized 3.38 ounces has 350 calories. Of all the Magnum bars, this is the most calorie dense. The bar's description is "Creamy chocolate ice cream enrobed in a luscious chocolatey coating, rich chocolatey sauce and thick Belgian milk chocolate" and as you can see, all of that is there and there is certainly not a shortage of chocolate anywhere in or around this bar. One thing that I did find somewhat surprising is how hard the outer chocolate shell was on this one. In a lot of these bars, the outer shell is hard, but breaks very easily. On this bar, the chocolate was dense and quite strong. Not a good or a bad thing, but just an observation. Biting into this bar, the double chocolate name was certainly met. This bar was chocolate, chocolate and more chocolate. 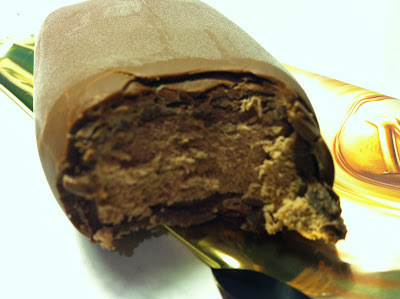 The outer chocolate coating was sweet, thick, rich and creamy as it melted in my mouth. The chocolatey sauce between the outer coating and the ice cream was also quite hard and added an unexpected and nice crunch to the bar. As you might expect, the taste of chocolate was quite strong on this too. That also applied to the chocolate ice cream as I got down to that as well and in fact, there was so much chocolate in this bar that by the time I got through a bite or two, I could not discern the differing chocolate flavors because they all blended together into one big sweet, rich and creamy chocolate mass. It was borderline overpowering and while I love chocolate, it was almost too much chocolate because it was so powerful. Buy It or Fly By It? I'll give this a BUY IT rating, although I think there is just too much chocolate going on here. Don't get me wrong, I liked this bar, but I missed the contrast of either vanilla or caramel like I've gotten in other Magnum bars and in fact, I prefer this one the least out of all the Magnum bars that I've tried so far because of that reason. I can't believe I'm going to say this because I didn't ever think this was possible, but I think the reason I didn't love this bar is because it was too much chocolate. That said, this is still a very good bar and I would recommend it to anyone. It just doesn't fit my personal preferences of what I'm looking for in an ice cream bar. I'm a massive chocolate addict too, so that is why I was so stunned when I came to the conclusion that there was just too much chocolate in this bar. Still, it's a darn good bar and worth anyone's purchase, as you well know. I don't remember the sauce layer having a crunch. I'm with dubba on letting it melt a bit. It changes the whole experience.